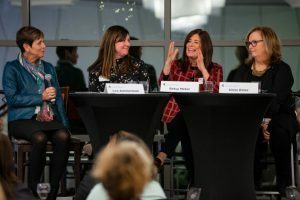 Professional women from across the region convened on Nov. 14 to connect and network with like-minded women at the Advancing Women in Business event held by the Eli Broad College of Business. 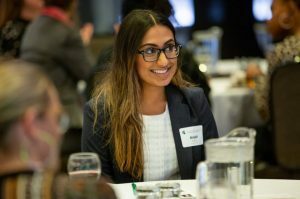 It can be difficult to take time out of a busy schedule to create new connections and keep the passion for personal development going, yet these women make the time for it. “It’s a wonderful networking event and it’s empowering to meet and hear from women (like me) who have had their own struggles and challenges and have persevered and been successful,” Julie Fasone Holder (BA General Business Administration ’75), CEO/founder of JFH Insights, said. The panel, moderated by Fasone Holder and consisting entirely of Spartan alums, was made up of Betsy Meter (BA Accounting ‘82), Michigan managing partner with KPMG LLP; Christine Oster, former global director of talent and leader development with General Motors; and Lea Ammerman (BA Integrative Management ’05), vice president of member services with MSU Federal Credit Union. Members of the audience asked questions that provoked a dialogue closer to a conversation rather than a standard Q&A. “Fantastic panel – loved the candid nature and honesty,” Lizzy Kennedy, Full-Time MBA candidate in the Class of 2019, said. The event was an important one for the present and future of business. The Broad College wants to see women at the forefront of tomorrow’s business. In order to reach this future, a little extra support may be all that is needed. “Women are lifelong learners and it’s important that we help each other reach our dreams and mentor each other. Women are eager to go for it — sometimes we just need a little encouragement,” Fasone Holder said.